In 2014 the Seton Brain and Spine Recovery Center needed to help physical therapy patients perform exercises correctly. Professor James Sulzer and his team of undergraduates invented a newly patented device already being tested today by Seton Hospitals and UT Athletics. In 2014 the Seton Brain and Spine Recovery Center came to James Sulzer with a problem. Their patients were performing shoulder exercises incorrectly and subjecting themselves to further injury, a particular issue for patients with spinal cord injuries. “We were looking for a device to help cue the patient when they are overusing the upper trapezius and hiking the shoulder,” says Eric Lantz, an occupational therapist at Seton. Sulzer, a mechanical engineering professor, and his students went straight to work, testing lots of ways to address the problem in his lab, known as Rewire. 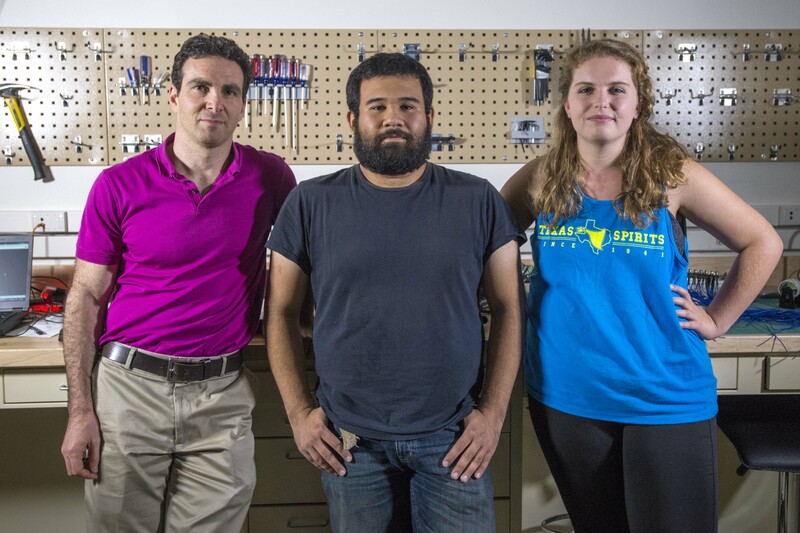 Sulzer, along with mechanical engineering majors Jose Juan Mendez Jr. and Nicholas Daniel Philips, invented a newly patented device already being tested today by Seton Hospitals and UT Athletics to improve shoulder exercises. The device lets people know if they are performing shoulder exercises safely by clicking if the shoulder is too high. Duannah Ashmore is in physical therapy with Lantz to help with her spinal cord trauma. She used the Rewire device for six weeks last spring. Now the team is working with UT Austin’s Office of Technology Commercialization (OTC) to patent the device. The OTC is working with a company to commercialize the device in hopes that it will be distributed nationally to hospitals, therapy centers and for at-home physical therapy. We visited the Rewire lab to talk about how they came to their simple invention with real clinical application. The Rewire Lab is also working on a way to help patients struggling to walk again. Above is a miniature prototype of the robotic gait trainer designed by graduate student Sung Yul Shin. The purpose is to provide gait therapy to spinal cord injured patients improving their ability to stand and walk. James Sulzer: Rewire stands for Rehabilitation with Insight from Robotics and Engineering. We’re part of a larger consortium of researchers and clinicians around UT Austin called CARE (Clinically Applied Rehabilitation Engineering). How would you describe your invention? Sulzer: The device is a piece of measuring tape between two stickers. It’s almost absurdly simple. 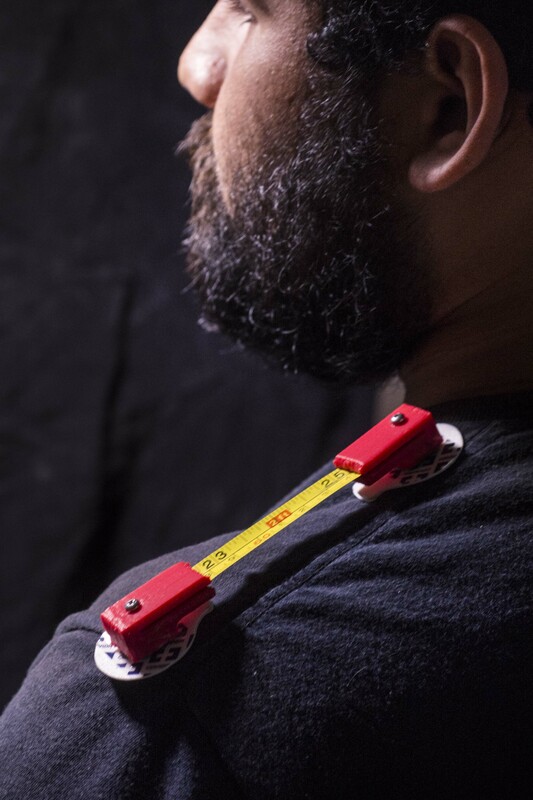 When it is attached to the neck and shoulder, it clicks when scapular elevation occurs, providing a sound to the patient without the need for observation of a therapist. We think that with this device people will be more independent in their shoulder therapy, allowing home use. 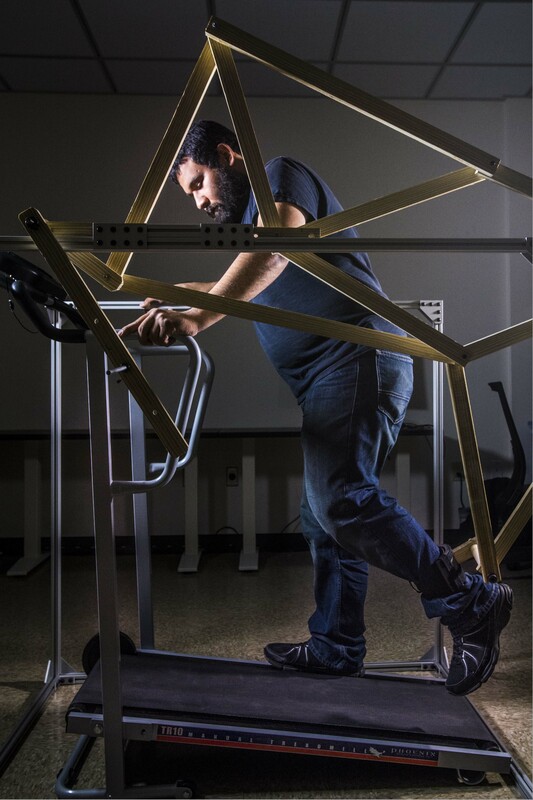 Mendez demonstrates the larger model of the robotic gait trainer. It applies complex knowledge of body kinetics to a low-tech solution for more affordable healthcare. How many other prototypes did you try? Why did you choose this simple version as the best choice? Jose Juan Mendez Jr: We went through four to five different prototypes. We began with an infrared red sensor system, but it was difficult to tune and rigging it on the shoulder would have been burdensome. After a meeting we then went back down to a mechanical solution. From there we went from a beam with relief cuts to supports with the measuring tape, and then with varying cantilever (overhang) length supports. We came down to its current simple version because it met the doctor’s and clinician’s needs of a simple-to-use, small and audio-feedback device. The solution that we came up with showed that simple is the best solution. It can’t get any simpler than tape and stickers on the sides. Why did you choose to study robotics and health? Sulzer: As engineers, we love to create things that solve problems. There’s an added sense of satisfaction when you have the chance to make a positive change to someone’s quality of life. 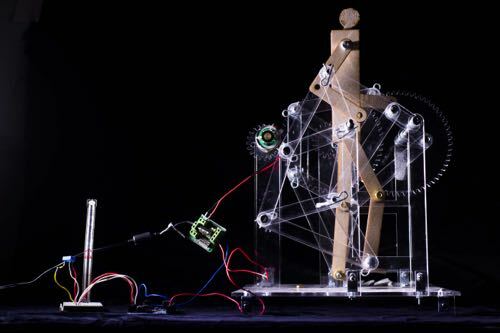 What has been the most challenging part of working on your invention? Sulzer: Making sure everything stays funded. Nicholas Daniel Phillips: Patience. Some of the things we work on take time and it is challenging to be patient when you want everything to work perfectly and smoothly the first time. I know overcoming all the hurdles will make coming up with a good solution worth it in the end. Mendez: Patience is the biggest challenge in this type of work. Working with doctors, clinicians and red tape makes it very difficult to keep work on a constant pace. Yet, the end result makes it all worthwhile. Rewire team working on the shoulder rehab device. From left, Professor James Sulzer, Jose Juan Mendez Jr., Emma Neuendorff. Not pictured: Nicholas Daniel Philips. What is your favorite thing about working at Rewire Lab? Sulzer: When the students begin to see the big picture — how their engineering skills can dovetail with clinicians’ knowledge and create something useful. It’s not as easy as it sounds. Phillips: I want to be a lifelong problem solver. Working at Rewire has allowed me to see that I might actually get to do this for the rest of my life and enjoy it. Mendez: My favorite part is hearing back from the clinicians that a patient is happily using the device. It lets me know that there’s a purpose to the work we’re doing. How has working in this lab shaped your time at UT? Sulzer: I think my biggest realization was that I’m not the guy leading things anymore, but rather guiding. The students here are phenomenal; my job is just to focus their energies towards a productive goal. Phillips: Working at Rewire has taught me to appreciate my education more. Before I felt like I was learning things just to learn them. Now I realize that I have been developing a certain “engineering mindset,” and classes, while still tough, are much more enjoyable. Also, Dr. Sulzer is a great mentor and has helped me realize, maybe not intentionally, certain career paths I would like to take further down the road. The Institutional Review Board recently authorized the lab to start quantitative human testing of the device. Engineering student Emma Neuendorff will be leading the test. 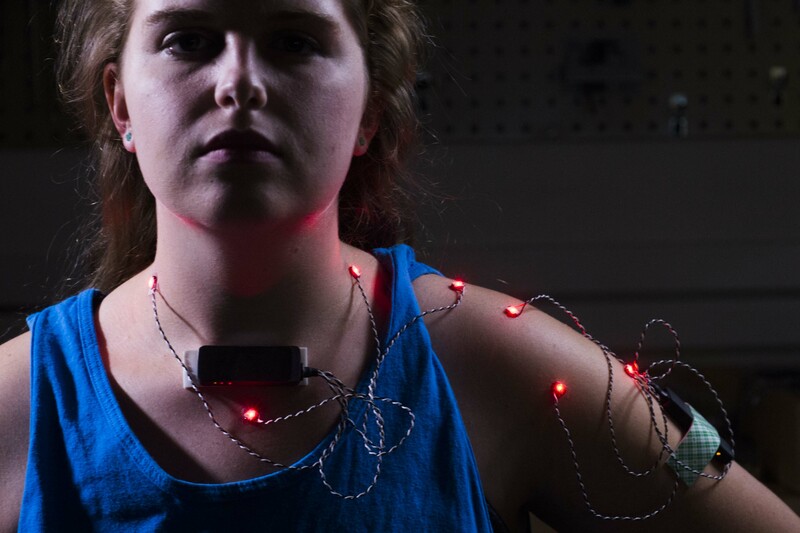 She is modeling sensors used to track the motion of the shoulder during the shoulder exercises. Mendez: Working at Rewire has helped me realize that I’m more capable than I thought I was. Coming in the lab I knew nothing about medical devices or working with any professionals. This experience has made me more comfortable to jump into an unknown field and seek out design-centered courses. James is a great mentor and after working in his lab it helped me narrow down the career paths I would like to work in. What do you want your lab to be known for? Sulzer: Improving stroke patients’ lives by understanding their problems and then developing the appropriate technology to address them. Sulzer: We’re conducting studies on the device now to examine how it can adjust to people of different sizes and then translating this to patient studies. We hope to learn how effective it is at assisting therapy. We have three areas we’d like to go into, home physiotherapy (a company is interested in licensing the device in that regard), neurological therapy after spinal cord injury, stroke or other injuries and diseases (its initial intended purpose) and, finally, athletics and biomechanics.